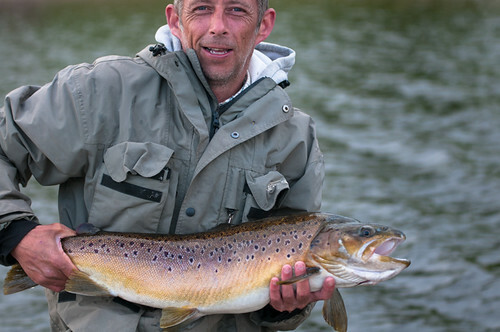 Tony Taylor caught this fantastic 8lb 8oz brownie today. It fell for a sunny days dial bach fished from Ben’s Beach. Gary Martin also fished for a couple of hours and caught two fish on dabblers. The trout are in shallow water at the mom ent feeding on minnows. They are taking ‘blingy’ nymphs and diawls and mini lures. Stocks will remain open until Sunday November 4th, which will be our last day of the season. Bob Fitzpatrick is leading the doubles club fish off with six fish catch weighing 13lbs 2oz. This entry was posted in Stocks Reservoir Fishing Reports on October 27, 2018 by staff. The best areas from the bank are from Hollins bay just down from the fishing lodge along the bank all the way to Bens beach with trout holding all along this shore. The best areas for the boats is still up at the northern end of the lake. The bouy line has now been moved to its winter limit so the right hand side of willow peninsular along to the causeway has been the favoured area with the boat anglers. This is the area where John Sykes caught his 5 fish. John caught on a di3 sinking line and a black and green cats whisker. The best catch today was made by Bob Fitzpatrick who landed 9 fish with both rainbows and browns weighing 3lb +. Bob caught a couple of fish from Bell point before heading off to the northern shallows where he encountered a lot of action with trout following and chasing his flies. The best set up for Bob was a sink tip line and a combination of orange and pink blobs with a fast retrieve being the key to getting the trout up and at the flies. Also out on a boat today is Derek Moore who as i write has landed 5 trout. Derek has found Hartleys bank and gull island to be his best areas with black and green patterns being his best on a sinking line. Like Bob Derek has caught trout in the 3lb + weight range. Syotw Paul. This entry was posted in Stocks Reservoir Fishing Reports on October 3, 2018 by staff.